In honor of Veterans Day, admission fees and vehicle entrance fees have been waived to the regional park facilities on November 10-17, 2012, for Veterans and their families. The motion, introduced by Supervisor Don Knabe, was unanimously approved today by the Board of Supervisors. Veterans will also receive a fifty percent discount off at County golf courses on November 12. All veterans with proper military identification will receive a fifty percent discount on green fees (excluding tournament play) all day on Monday, November 12. 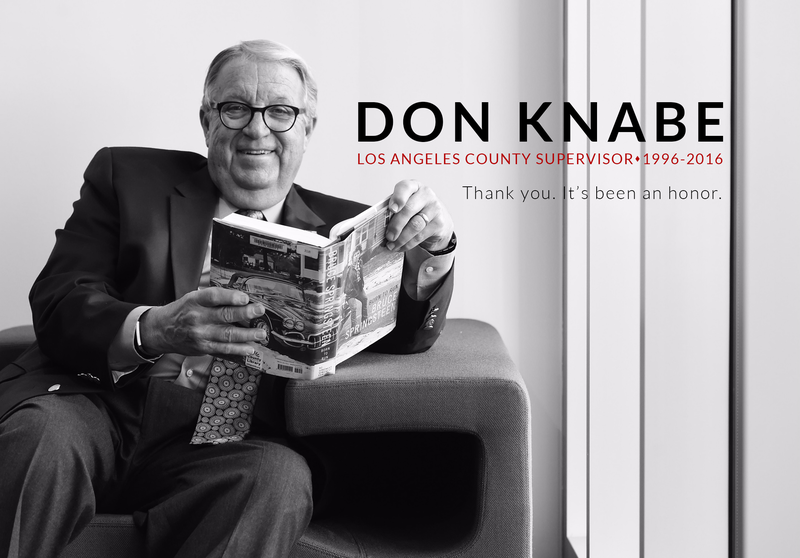 Supervisor Don Knabe today called upon federal and state legislators to amend decades-old laws and regulations to encourage the development of innovative conversion technologies in Los Angeles County, as an alternative to landfills. Through conversion technologies, trash that would get dumped in a landfill would be converted into fuels and energy sources. For example, the 8 million tons of waste sent to landfills by County residents and businesses each year could potentially produce over half a billion gallons of renewable biofuels. For years, cities and counties in California have led the way in recycling and waste reduction. But, while LA County’s award-winning programs have resulted in one of the highest recycling rates in the nation, there continues to be a substantial amount of residual waste remaining. Supervisor Knabe said conversion technologies are already successfully operating in 28 countries worldwide but California laws written over two decades ago only envisioned trash being buried or burned. “They did not account for these sophisticated technologies being able to recover products and fuels from trash and erroneously consider them equivalent to landfills and incinerators, thus creating barriers to their development,” Supervisor Knabe said. “We must seize the opportunity and continue to lead in this effort, working diligently with State officials and legislators, other municipalities, scientists, industry representatives, and other key stakeholders to modernize State and Federal law and regulation to support, rather than discourage, these promising technologies,” he added. Los Angeles County Supervisor Don Knabe directed the Department of Beaches and Harbors to re-write the section of the County’s recently adopted beach ordinance to clarify the section on ball and Frisbee playing at the beach. Supervisor Knabe is directing the Director of Beaches and Harbors to rewrite the ordinance in a manner that clearly states that such activities by small groups and individuals are allowed on the County beach, unless directed otherwise by the County Lifeguard or other designees to protect public safety and enjoyment of the beach. Starting now, and continuing every Saturday throughout the month of February, Los Angeles County residents can enter to win a VIP night, complete with limousine service, dinner for two at L.A. Live and tickets to a basketball game at Staples Center, home of the Los Angeles Lakers and Los Angeles Clippers. To enter the Team Clean LA sweepstakes, residents will need to bring their used oil products to one of the following HHW collection events. The events are held, rain or shine, from 9 a.m. to 3 p.m.
County residents can also dispose of other toxic automotive and household products, including brake fluid, paint and paint thinner, household cleansers, pesticides, herbicides, batteries, pool chemicals, oil filters, expired medication, antifreeze, fluorescent light bulbs and sharps (syringes and needles). Household electronic waste, known as e-Waste, is also welcome. For more information on future HHW Collection events, visit www.cleanla.com, follow us on Twitter @CleanLA, or call (888) Clean LA. In honor of Veterans Day, all veterans with proper military identification will receive a fifty percent discount on green fees (excluding tournament play) all day on Friday, November 11. For more information on “Veterans Appreciation Day” contact your local County golf course. The County of Los Angeles Department of Parks and Recreation in conjunction with the United States Department of Agriculture and the California Department of Education is providing approximately 220,000 free lunches and snacks to children in 47 County parks beginning this week. This health-focused program was created to provide a healthy alternative for children during the summer months and to reduce the growing percentage of obese youth in the United States. The program, available to children ages 18 and under, will take place at scheduled times daily Monday through Friday. Lunches and snacks will include sandwiches, fruit, vegetables and healthy dairy products such as milk, string cheese and yogurt. In a motion by Supervisor Don Knabe, July 2011 has been declared “Junior Golfers Appreciation Month” throughout Los Angeles County, and to salute the County’s young golfers, green fees have been reduced to $1. For more information on “Junior Golfers Appreciation Month” contact your local County golf course. Attention Shoppers! Starting July 1, 2011, carryout plastic bags will be history in stores located in unincorporated Los Angeles County! Bring your reusable bags every time you shop to avoid a 10 cent charge for paper bags. Staff from the Department of Public Works will be on hand at several Fourth District supermarkets to hand out canvas bags on a first-come first- serve basis from 10:00am to 3:00pm. For more information, visit About the Bag. Today, the Los Angeles County Board of Supervisors approved a ban on single-use carryout bags at all grocery stores, convenience stores, pharmacies and drug stores located in the County’s unincorporated areas. As part of its approval, the Board supported an amendment by Supervisor Knabe which revised the definition of “reusable bag” to include language that a reusable bag can be cleaned or disinfected, not just machine washable. In honor of Veterans Day, admission fees and vehicle entrance fees have been waived to the regional park facilities on November 6-13, 2010, for Veterans and their families. The motion, introduced by Supervisor Don Knabe, was unanimously approved today by the Board of Supervisors. This fee waiver follows on Supervisor Knabe’s earlier motion for a fifty percent discount off greens fees for Veterans at County golf courses on November 11, which was approved earlier this month.